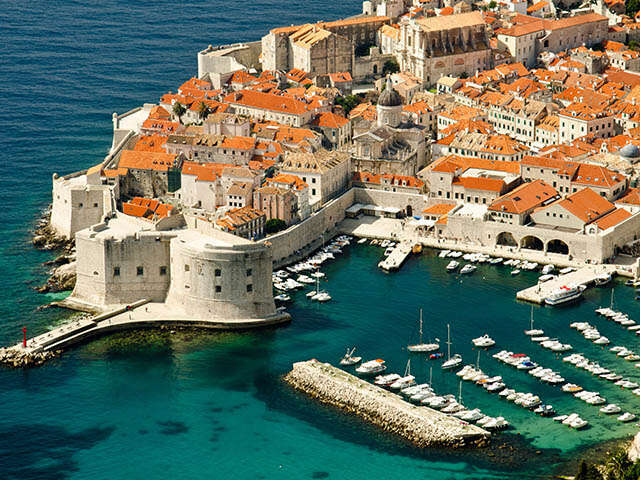 Carved out of the Adriatic coast, Croatia is a country of walled towns, dramatic seascapes, and Balkan passion. Once ruled by countless kingdoms and empires, it fascinates with its complex history. Look for this legacy in age-old monuments gracing scenic villages and cities. Escape it on the shores of electric-blue lakes or rocky beaches, in breathtaking national parks or on magnificient islands. Dry-salted ham, squid ink risotto, peka (a meat and vegetable dish cooked in a lidded pot under burning embers), and fresh fish. Licitar (heart-shaped biscuits), embroidered lace and a traditional red Šestine umbrella (part of the country’s folk costume). 1. Diocletian’s Palace: Hanging harbour-side is this imposing remnant of Roman opulence, built around the 4th century as a retirement home for the Emperor Diocletian. The ruins—gates, vestibule, temple, square, and more—are spread across Split. 2. Dubrovnik’s City Walls: Built around the 15th and 16th century to protect the city, the walls surround the Old Town and include five imposing forts. You might also recognize the fortifications as the stand-in for King’s Landing on Game of Thrones. 3. Trakoscan Castle: Meet Croatia’s very own fairytale castle, perched on a verdant hill, circled by a forest, overlooking an idyllic lake and located only an hour away from Zagreb! 4. St. Mark’s Church: Zagreb’s 13th-century church is iconic due to its colourfully tiled roof bearing the coat of arms of Zagreb on one side and of Croatia, Slavonia and Dalmatia on the other. 5. Istrian inventions: Look to the Istrian peninsula for two architectural marvels: the incredibly preserved Roman amphitheatre in Pula (sometimes used as a concert venue!) and the splendid 6th-century Byzantine Euphrasian Basilica in Porec. 1. Capital museums: Of course, the capital of Zagreb is your go-to for museums in Croatia. Stand-outs include the Museum of Contemporary Art, the Archaeological Museum, the Nikola Tesla Technical Museum and the quirky Museum of Broken Relationships. 2. By sun and sea: Be amazed at the ingenuity of Zadar’s nature-based art installations by Nikola Basic: the Sun Salutation and the Sea Organ. One is composed of solar panels that convert the day’s rays into a nocturnal light show, while the other is an instrument creating music based on the motion of the sea. 3. Street art: For open-air theatre, dance and performance arts, be entertained by Zagreb’s citywide Cest is D’Best festival in late May and early June, as well as the summer festivals in Split or Dubrovnik in late July and early August. 4. Mestrovic Gallery: Works of art inside a work of art—that might be the best way to describe the gallery of Ivan Mestrovic, Croatia’s most famous sculptor. The stunning monument in Split houses hundreds of sculptures, architectural plans, drawings and more. 5. Music with a view: Soak in the scenery with a soundtrack at Zagreb’s lakeside INmusic Festival in June, at the outdoor electro extravaganza that is Split’s Ultra Europe in July, or at Pula’s Dimensions Festival featuring DJs and dance music blasting around a beachfront, historic fort in August. 1. Sea-to-table: It’s all about seafood here. Octopus, squid, oysters—savour them fresh, grilled, boiled, in a risotto or in a salad, plucked from the sea and served best in top coastal destinations like Dubrovnik, Rovinj or Split. 2. To go, please: You’ll need some street snacks for your strolls! Pick up some delicious burek (stuffed phyllo pastries), cevapi(Grilled meat in bread) or fritule (fried dough balls) for your sweet tooth. 3. Wine time: Move over France and Italy—Croatia’s earned its reputation as a top wine destination. Sample zinfandel wine in the vineyards of the Dalmatian coast (Kastela or Dingac) or the cool, sparkling wines produced around the hills of Plesivica (near Zagreb). 4. Market day: Croatia is also known for its fine produce, olive oils and cheeses (Pag cheese!). Stock up on the country’s best organic goods at Zagreb’s delightful Dolac market or Dubrovnik’s historic Gundulićeva Poljana. 5. In good spirits: Top off your Croatian culinary experience with local liqueurs: rakija (fruit brandy available in various flavours like plum, pear or walnut) or pelinkovac (a bitter, herbal liqueur). 1. Legendary lakes: What makes Plitvice Lakes National Park an absolute must-see? Sixteen azure lakes divided by cascading waterfalls and encircled by mountains and green woodlands! Enchanting and ethereal, the park is 300 square kilometres of pure, natural beauty. 2. Island vibes: Croatia is more than its mainland—the country includes 1,200 islands to sail around and explore. Set out to the dream-like islands of Hvar, Vis or Brac, all easily accessible by ferry from Croatia’s main coastal cities, and all home to world-class beaches. 3. Green queen: Speaking of islands, we should highlight the greenest of them all, Mljet, shrouded in dense, emerald-hued forest. Unspoilt and wild, wander across a verdant, Mediterranean paradise complete with two lakes and a large national park. 4. Peak Croatia: Croatia’s landscapes take a turn for the dramatic around its largest mountain range, the Velebit. Access craggy cliffs, jagged peaks and untamed wilderness from the Northern Velebit National Park or opt for the deep gorges, gentle paths and rocky canyons of the Paklenica National Park at the range’s southern end. 5. Cut to Krka: In gorgeous Krka National Park, follow a scenic, waterfront trail, swim at the foot of turquoise-tinged waterfalls, or take a boat trip to a tranquil monastery built on a small island in the middle of the Krka River.